Okay, let’s start as basic as you can get. You might wonder why bother with this. 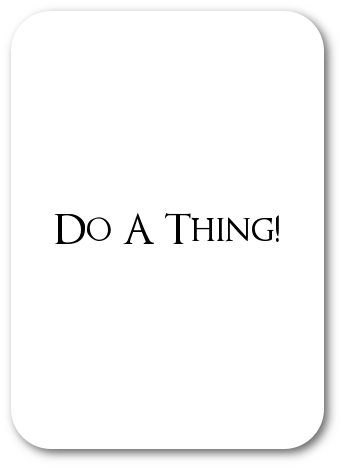 First, you should always start with the simplest version of anything. Hell, this isn’t even as simple as it can be, but it’s my starting thought. Text is easy to generate (compared to individualised graphics and icons). Starting from this we can see that we have a lot of room, too. Also a white panel with black text is a bit weak, obviously. I mean this gives us a lot of room to do interesting aesthetic things, but also we have room to make this more complex. What do we do if the card gets flipped and shows a thing the monster can’t do? 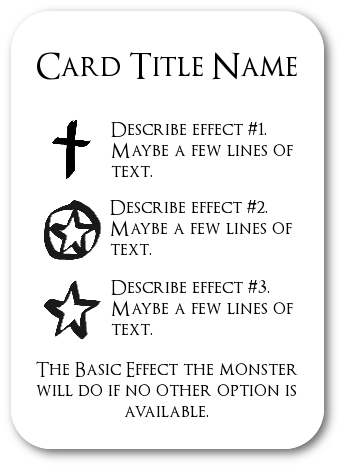 Well, we can leave the card like this and just say sometimes the monsters are confused, or we can design the monsters so they always have an option, that’s fine. Just asking the question, though does open up a few solutions, one of which is interesting. 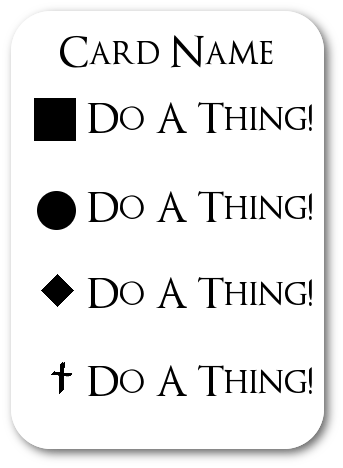 Now, in this example, this creates a priority list. The icons can indicate a situation, or maybe even a power from a sheet. Consider a D&D monster, which has a group of powers they’ll use, and this card is just going to randomise whichever one gets the priority at each turn but by being on cards, you have control over which they ‘randomly’ do. I like this, I like this as a simple little mechanism to make a D&D monster easier to run, and maybe even make them automatic for single-player D&D. Now, this feels like the Soulsiest version. In this case, there’s room enough for each entry to actually explain a priority, and there are a number of possible trigger symbols. It might be that a monster with a torch will always have the top power prioritise a target who is currently vulnerable to fire, for example. Okay, so here are some ideas. Are there any problems? The first thing that springs to mind is the volume. You want a reasonably varied number of cards, and you want them to be different enough from one another, because otherwise you’re just making a complicated system for no meaningful end, like how Kingdom Death Monster uses a ‘deck’ of cards to just simulate rolling a dice. That means you need say, six or seven cards at least and that needs to be per monster. Maybe if the monsters behave in groups at the same time – and that pulls us back to the idea of using this kind of design for D&D monsters. If you didn’t do that, though, without miniatures, these cards want to have a general idea of the ‘positions’ of enemies too. That’s also a problem, more information the card faces have to store. Then you’re tracking a lot of objects, which needs a lot of physical space on the table, and that can be a problem and get out of hand. Maintaining five or six seven-card decks means a skirmish between the players and five monsters isn’t a small battle it’s a big elaborate sequence of card placement and checking and shuffling. That’d need addressing. Dark Souls monsters care about positioning, a lot, and that invites a 3d space of some variety too. Maps and miniatures, maybe, where the monster lunges ‘towards’ things but has a turning circle. Sounds interesting, but that kind of mechanic gets fiddly fast. In a more deck-based game, though, you could have a bunch of monsters mixed up in one deck, maybe, and they just act in sequence, maybe with a rule that doubles go on the bottom of the deck so no monster just endlessly acts at once. And that’s just some of these parameters. What’d you think of the idea?